Entrepreneurs that wish to set up new online businesses have a special reason to rejoice as we launch the 'Build a Bazaar' platform. This unique eCommerce platform will enable individuals to create online store with their own branded URL. The process is as simple as registering a store, uploading product catalogs and selling. The entrepreneur setting up his business online has the advantage of making the products visible to millions of visitors at Infibeam. That is not all; the products may be showcased to our affiliates as well; as part of our Affiliate program. Additionally, we will allow store owners to run their own self customized, branded online business where an owner can upload their own product catalog comprising different catalog size options along with the option to do their own customized site configuration. Once uploaded, the products can be made available for sale on Infibeam.com and hundreds of stores using our platform through the Infibeam Affiliate program. Products and product categories from our retail supply chain is also made available under store owner's own brand at no additional cost. While we ship the products, the store owner will get paid a commission for such transactions under their own stores. Besides, the ecommerce platform will provide useful tools for regular website management, and useful features such as updates, promotions, and new product releases, among others. Powerful tools for catalog, inventory and order management are also available. 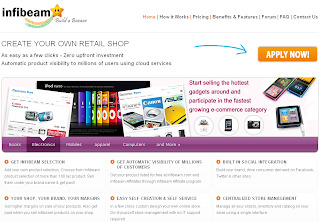 Store owners can thus manage their inventories on multiple affiliate stores through a single interface. We are inviting applications from interested applicants. One can apply online at www.buildabazaar.com. We will enable selected applicants to setup their own online store. The applications will be accepted till 7th June and selected applicants will be announced on 10th June.